Now that the summer heat is here to stay (for a few months, anyway), I need to start looking for some lighter meals for hot summer days. It seems with every new season, I find myself sitting at the computer browsing recipe sites and foodie blogs for new ideas to add to our already tried and true recipes. Since I spend so much time outdoors with Grace during the warmer months, getting dinner on the table is often a challenge. I use my crock pot a lot during the summer, allowing my dinner to cook all day while were playing outside. But sometimes that gets a little old. In an email last week, I saw a recipe I just knew we would love! I checked my pantry and called Joe and had him pick up a couple lemons on his way home from work! I made a couple of small changes that resulted in a perfect summer pasta dish, perfect for us! I was also excited to have an excuse to use the fresh basil we just planted a couple of weeks ago! I served it as a main dish that first night and we finished the entire pan of it between the two of us! We loved it so much, I prepared it again the next night and served it as a side dish! Cook & drain pasta according to the direction on the box. In a large skillet, add garlic and red pepper flakes to 2 Tbs. of hot olive oil. Cook over medium heat until fragrant. Add carrots and fresh basil to the skillet and saute. Combine the remaining 2 Tbs. olive oil with the juice of one lemon. Stir in the lemon zest. When the carrots are slightly tender (or the tenderness that you desire), stir in the drained pasta. 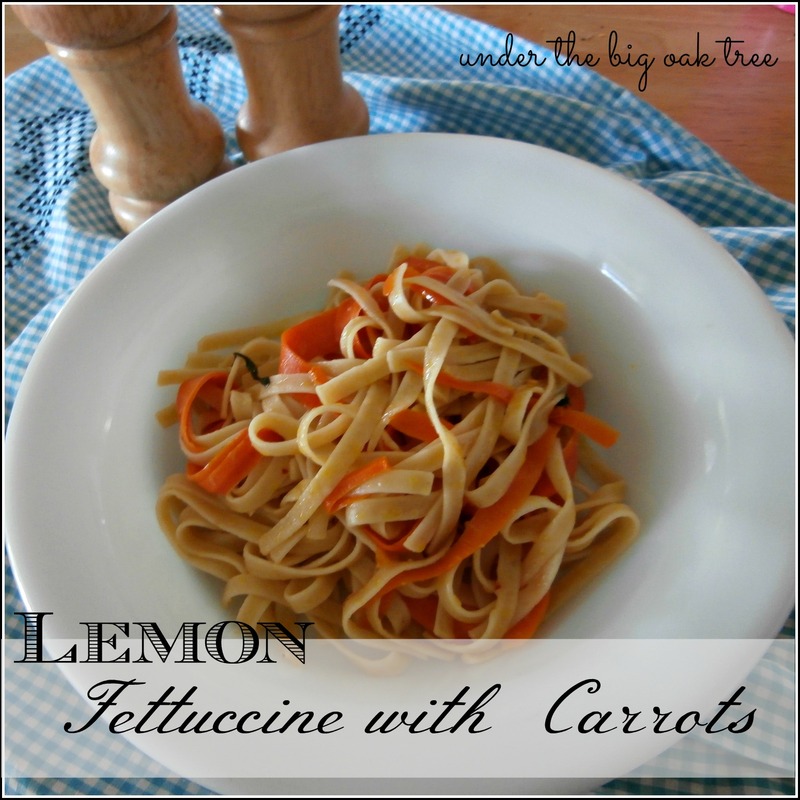 Pour the oil/lemon juice mixture over the pasta and carrots, stirring until evenly coated. Serve either as an entree or side dish. The original recipe called for grated parmesan. I'm not a fan, so I left it out. I also left out the salt, since we're cutting back on sodium. Also, since we're not much for garnishing our plates, I just added the basil to the pan when I cooked the carrots and added the lemon zest to the lemon juice/olive oil mixture before pouring it over the pasta. Since we omitted the salt, the crushed red pepper flakes were a delicious addition! I love the combination of the lemon and spicy pepper flakes! I prepared this recipe twice last week and it's appearing again on this week's menu plan! I think this recipe is a keeper!